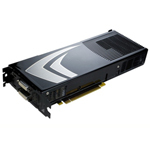 NVIDIA along with its partners recently released the GeForce 9800 GX2. The GeForce 9800 GX2 combines the two GeForce 9800 GPUs in a single graphics solution, which offers 256 processor cores and a frame buffer of 1 GB (512 MB per GPU). With a launch price of $599 - $649, the GeForce 9800 GX2 is close to the same price the GeForce 8800 GTX launched at. It also allows a user to take advantage of the second-generation Quad SLI technology. I would love to have one of those. I'm not into the who SLI / crossfire thing. I'll stick with one card thank you. If two chips on one card works then well ok.
.. I tried getting a HD3870x2 in to put against it but didn't have any luck. I wouldn't mind having one of those either. Probably could more realistically afford on of those though.